There are even mad geniuses out there plying fancier forms of craft, like the folks who mashed together Serena Williams' U.S. Open meltdown with the VMA incident. The star of the latest registration campaign, which opens Sept. 8, is none other than Iran's president. 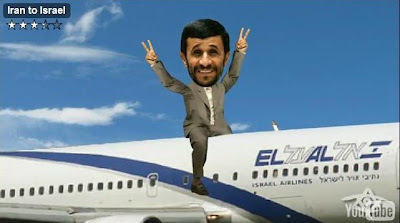 Unlike the usual depictions of him in the Israeli and pro-Israel press, Ahmadinejad isn't threatening to wipe Israel off the map in this video clip. On the contrary, what he really wants is a chance to go on a Birthright Israel trip. My short cartoon Bike Safety PSA #01 was shown in BuBiFeszt, the Budapest Bicycle Film Festival, on September 5, 2009. Egyperces figyelemfelkeltő rajzfilm a biztonságról, rímekbe szedve. Készítette: William Levin.